No. 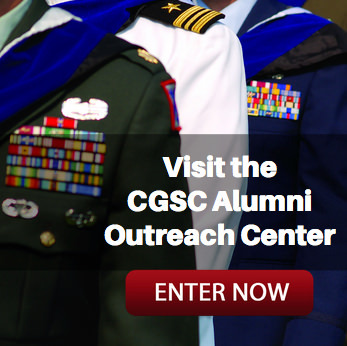 21/Fall 2016 (Nov) | Command and General Staff College Foundation, Inc. 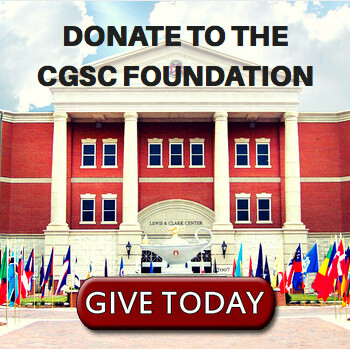 In this edition we welcome the 2017 CGSC classes of SAMS and CGSOC, which are well underway. 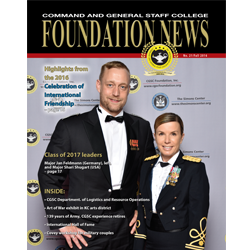 – See the feature on the new class of international officers and our annual celebration on page 15. We also continue our “CGSC 101” series that highlights the College’s teaching departments with a feature on the Department of Logistics and Resource Operations (DLRO). We also have a features about the newest inductees to the International Hall of Fame, some significant staff and faculty retirements, as well as a feature about a local art gallery that conducted a CGSC exhibit…and much more. As a reminder, we publish a “digital version” of the magazine on our website, so all the links you see in the print edition will be active in the digital edition. We hope you enjoy this 21st edition of the Foundation News. To view the Foundation News in the online “digital edition” click the cover image at right. In this digital edition all the web links you see in the print edition will be active in the digital edition…or if you’d still rather download a pdf there’s a link for that as well. NOTE: You can still download the magazine in pdf and “Adobe AIR™” from within the digital edition as well. The AIR™ version requires software if it isn’t currently installed on your computer.